The white below his nose is his mustache not his teeth. I'd have preferred to get out of the car to get closer to them but they shyness would have caused them to run off. Having the freedom to come and go as we please has enhanced the quality of the experience in Marloth Park. If, that seems possible when we're already having the time of our lives. 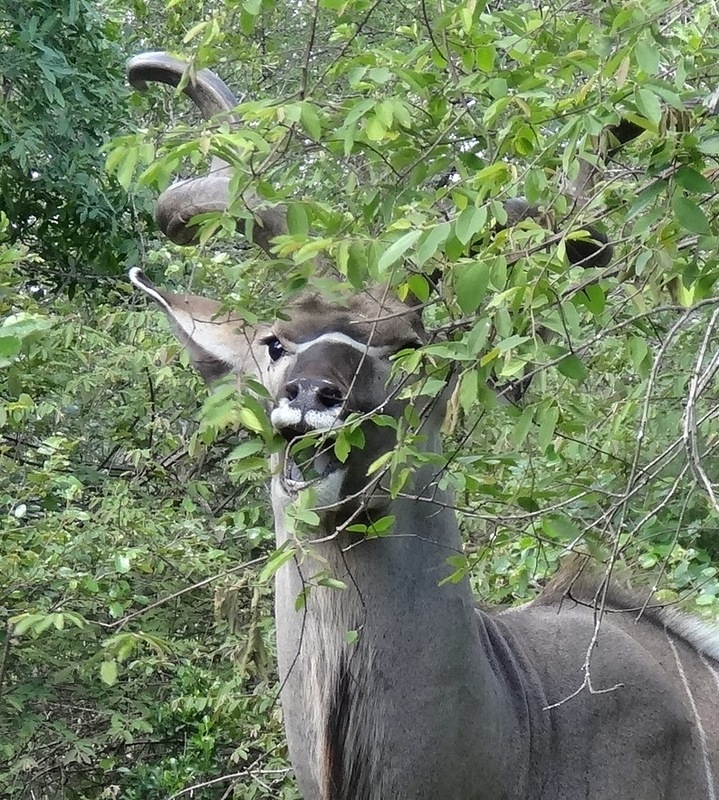 The kudus were so busy chomping away, it was hard to encourage them to look our way. With the little pink India-made vehicle in our possession for less than two days, we've certainly been out and about, spending only a few daylight hours at home, long enough to post yesterday and sleep at night. The kudus were in dense bush in our yard having their hearty breakfast. We wondered if they would have come closer to us had we been on the veranda. Now, every time we leave we'll wonder if visitors come that we'll have missed. To tell the truth, I've already begun to miss our time outside on the veranda, from early morning until dusk, anxiously awaiting the arrival of yet another visitor. From the short periods we've been home over the past 2 days, it appears the pace may once again be picking up and they're returning to visit. Saturday, while halfway down our long driveway, we were thrilled to see three male kudus happily chomping at the treetops. Although kudus are not as tall as the giraffes their enormous height makes it possible for them to munch on the tops of many trees. While driving in Marloth Park yesterday morning, Tom yelled to me, "Hurry, get the camera. This dung beetle and his wife were crossing the road with this huge piece of dung. I was able to take this very short video when cars behind us required we move along. We would love to have seen how they maneuvered the rocks that were in their way. Yesterday, while we were gone, Louise stopped by to pick up the cooler we'd borrowed, to find our veranda a horrible mess with baboons having taken over. Again, they'd moved the furniture, taking more of the seat cushions pooping everywhere. She cleaned it all taking the dirty cushions with her to be washed. Thanks Louise! When we returned hours later, apparently the Baboons had returned since she'd cleaned and left another mess. Once we put away the groceries, we cleaned the veranda, wrote and posted indoors. With many tourists in the area for the holidays, our connection was slow making it difficult to post our photos, taking twice as long as usual. The vegetation around the Crocodile River is lush and green now that it's summer. Suddenly, it was time to leave in order to get to the Crocodile Overlook before sunset and later to Jabula Lodge for dinner. To our disappointment, the overlook was jammed with tourists making it difficult to get a good spot along the railing for photo taking. I must admit, the crowd spoiled the experience and we took very few photos. After New year, the crowds will disperse and once again, it will be peaceful and quiet in Marloth Park. We're looking forward to this time but will make the most of these crowded next 10 days. On our way to dinner, we spotted giraffes lumbering into a yard. Last night, returning after another great dinner at Jabula Lodge, we checked out the pool for the status of the tadpoles. Nothing yet, but we continue to see the little swirls of water where they're swimming. As we stepped to the side of the pool both using our mini flashlights, we saw a scorpion jump into the pool, a definite suicide mission. Today, he lies dead at the bottom of the pool. Later today, we're going on another game drive in Kruger Park with 18 tourists in the huge open sided vehicle, followed up by another bush dinner. We'll do our best taking photos and sharing our experiences tomorrow. Guess I'll be wearing my boots again tonight with my Bugsaway pants tucked tightly into the pants!